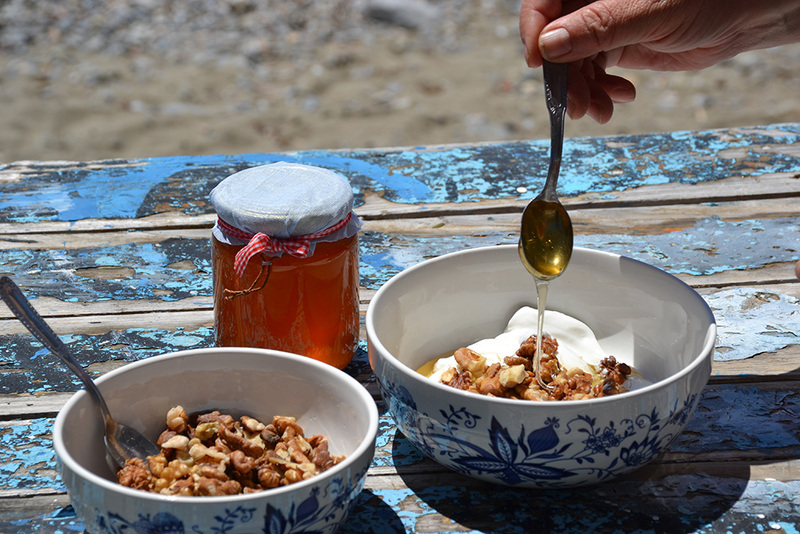 Whether you eat it for breakfast, lunch or dessert, Greek yoghurt with honey and walnuts is a real treat! Take your cutest bowls out of your cupboard and fill them with Greek yoghurt. …and drizzle as much honey as you like on top…. Enjoy!! I also love to ladle Teaspoon Sweets on yoghurt, but for you to try that you have to come to Greece! Teaspoon Sweets are not a jam or jelly. They are made of fruits, flowers, vegetables, nuts and often surprising ingredients that in a raw form are not edible, like green figs, quinces or citrus peel. The ingredients simmer for a long time in a sweet syrup before they are put in jars. During the whole process I don’t use any preservatives, colors or glucose. The fruits retain their original color, taste and aroma. They are still firm and juicy. In Greece it is tradition to serve the teaspoon sweet to guests and family. It is served on the prettiest small plates with little teaspoons, from where the sweet gets its name. …and here is one of my favorites, the Lemon Teaspoon Sweet. Take your cutest bowls out of your cupboard, fill them with Greek yoghurt and break a handful of walnuts over it. Drizzle as much honey as you like on top. Hi Katerina, I spent 3 weeks traveling through Greece last April, and am getting nostalgic. I love Greek food and welcome all your recipes with open arms. I have yet to find a grocery store Greek yogurt in Canada that tastes as luxurious as the ones I had in Greece. None are as creamy and smooth. Do you have a homemade recipe for Greek yoghurt? Thank you! It’s so nice that you got to travel 3 weeks in my country! I am glad you loved it! As well that you are enjoying my recipes. How did your cooking turned out? I unfortunately have never made Greek yoghurt. When I was young and lived with my family we had sheep and goats and made our own cheese, but never yoghurt. But I am going to find out for you how to make it!